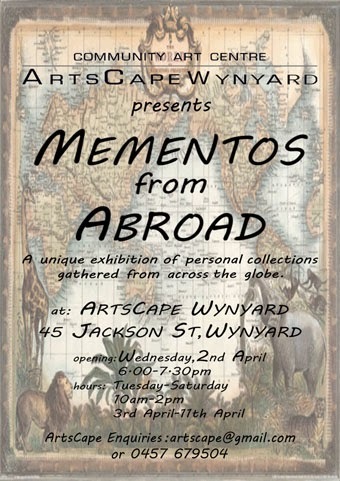 What our members have collected from around the world ~ an Exhibition of favorite pieces of art, with words to describe why they are memento worthy to their owners. An intriguing, eclectic mix which will delight, surprise, perhaps even shock! Knitwits, ArtsCape's knitting group have changed their meeting to alternate Wednesdays from 10 - 12, the next one is on 4th June, do come along and join us! Word Players, ArtsCape's writing group meet once a month, usually on the 3rd Thursday from 7 pm, the next one is on 19th June.